These cookies are soft, chocolatey and delicious. They are like small cookie shaped brownies. I served them at my Southern Tea Party and they were a hit. You can make them dairy free by using margarine instead of butter and by making sure the chocolate you use is dairy free. I have not tried making these without eggs; when I do I will post a vegan version. The original recipe for these cookies was given to me by Beverly, a nurse I use to work with. She was famous for her holiday cookie baking. She started baking cookies as holiday gifts. Over time the cookies were so popular that she began to bake hundreds of cookies and mail tins of cookies all over the country. She would spend all year searching for just the right tins to use. I do not know which cookbook Beverly got this recipe from and, as we are no longer in touch, I cannot ask her. We all looked forward to her cookies at holiday parties. Beverly’s cookies were very delicious and looked very professional and beautiful. 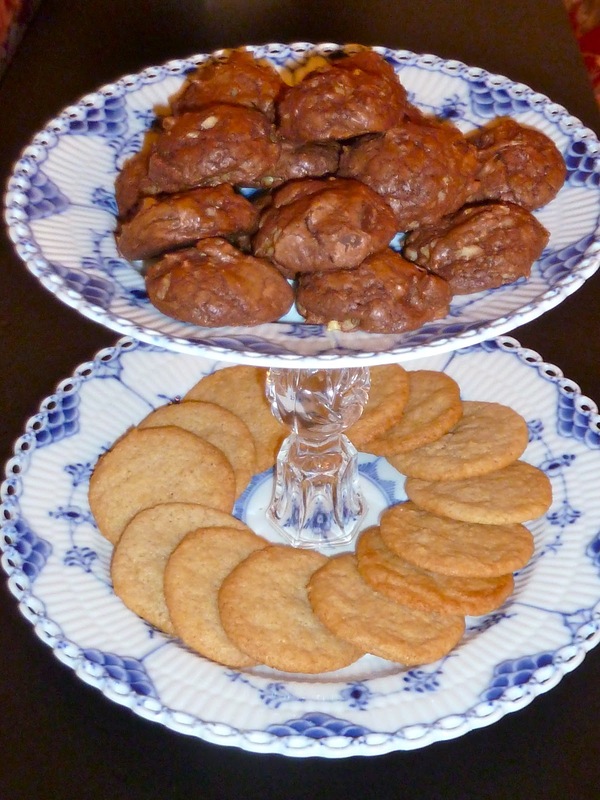 Unlike cakes or breads, cookies are easy to convert to a good gluten free version. You just use an equal amount of gluten free flour (the same amount as the regular flour called for in the recipe) and also add ½ tsp. of xanthan gum. The trick is in knowing which types of gluten free flour to use. I find that for cookies, cakes, quick bread and pies the following formula works well every time: replace 1 cup of regular flour with ½ cup sorghum flour, ¼ cup tapioca flour and ¼ cup of chickpea (garbanzo) flour. I do not use rice flour in cookies, cakes etc as I find it makes them too heavy and grainy and they do not adequately replace the regular baked goods in texture. There are many GF flour blends and mixes out there. I prefer buying the three GF flours and measuring them out as needed instead of buying a more costly pre-mixed product. Using flours that are different from the ones in the recipe will alter the baking results. Cover baking sheets with parchment paper or use silpat liners. In a small saucepan melt butter (or margarine) and semi-sweet and unsweetened chocolate. When smooth and melted remove from heat and allow to cool. Butter, coffe and eggs beaten for 3 minutes. In a large bowl, or the bowl of a stand mixer, add sugar, instant coffee granules, and eggs and beat at highest speed for 2-3 minutes. Chocolate mixture added to egg mixture. Add melted chocolate mixture and blend together with a spatula. In a separate small bowl add flours, xanthan or guar gum, salt and baking powder. Mix with a whisk until well combined. Add flour mixture to chocolate mixture and mix well with a spatula or spoon. Stir in nuts and chocolate chips and mix well. Cookie dough scooped 2 inches apart onto a baking sheet lined with a silpat mat. Drop by teaspoonful, 2 inches apart, onto prepared baking sheets. Bake for 7-11 minutes or until the tops of the cookies are cracked. Do not overbake or the cookies will be dry and hard. Cool for 1 minute before moving to a rack to completely cool. Store cooled cookies in an airtight tin for up to a week, or freeze the cookies for longer storage and thaw before using. You can also freeze unbaked dough balls until ready to bake. HEAVENLY CHOCOLATE BROWNIE COOKIES Ingredients 4 ounces Semi-sweet Chocolate 2 ounces Unsweetened Chocolate 1/3 cup Butter – Unsalted (for dairy free use a margarine such as Earth Balance) ¾ cup Sugar 1 ½ tsp. Instant Coffee Granules 2 Eggs ¼ cup Sorghum Flour 2 Tbs. Tapioca Flour 2 Tbs. Chickpea (Garbanzo) or Fava/Garbanzo flour ½ tsp. Xanthan or Guar Gum ½ tsp. Baking Powder ¼ tsp. Salt (omit if using margarine) ¾ cups Chocolate Chips ¾ cups Walnuts - chopped Directions Preheat oven to 350 degrees. Cover baking sheets with parchment paper or use silpat liners. In a small saucepan melt butter (or margarine) and semi-sweet and unsweetened chocolate. When smooth and melted remove from heat and allow to cool. In a large bowl, or the bowl of a stand mixer, add sugar, instant coffee granules, and eggs and beat at highest speed for 2-3 minutes. Add melted chocolate mixture and blend together with a spatula. In a separate small bowl add flours, xanthan or guar gum, salt and baking powder. Mix with a whisk until well combined. Add flour mixture to chocolate mixture and mix well with a spatula or spoon. Stir in nuts and chocolate chips and mix well. Drop by teaspoonful, 2 inches apart, onto prepared baking sheets. Bake for 7-11 minutes or until the tops of the cookies are cracked. Do not overbake or the cookies will be dry and hard. Cool for 1 minute before moving to a rack to completely cool. Store cooled cookies in an airtight tin for up to a week, or freeze the cookies for longer storage and thaw before using. You can also freeze unbaked dough balls until ready to bake. Makes about 3 dozen cookies.